And now, as promised - this is what we did to potty train The Incredible Hulk. As you'll remember from the aforementioned post, potty training did not happen overnight. The only thing we remained consistent about was this methodology. No matter what...even when we wanted to deviate...we remained consistent. If you take nothing else away from this post, please take this - BE CONSISTENT. Using the bathroom is a behavior. You are shaping that behavior. The minute that you remove some of your own reinforcers or change them, the message gets lost in translation. If Pavlov had switched from a bell to a siren, it would not have elicited the same response from his dogs. So, unless what you are doing is truly not working (given multiple trials), stick with what you are doing. Whatever method you're using, that's the most important thing. Okay? Write that down. That part is important. - A chart (This doesn't have to be anything fancy, but I found a few free printable ideas on Pinterest. You can find those here.) I made our chart with a Sharpie and a piece of printer paper. Okay, now you have your materials. Now here's the plan. This is a working mom friendly blog, right? Not all working moms get 2 weeks of vacation at a time. I happened to get exactly that. I truly feel this could be done over a long weekend or the matter of a few days, but that's going to be a game time decision for you. I knew TIH would need a bit more time. So, use what time you have. This is best completed with some nice one on one time. Parents with more than one kid at home? Chances are you're better at this than me, but you might need someone else to help you out with the other kiddo. The potty training kid needs some undivided attention. Or, just be ready to clean up some messes. And that's okay too. Momming is messy. So, my first step was waiting until my vacation was coming up. The weeks before the vacation, when TIH came home from school, we would immediately change him into underwear from his diaper. This was to encourage him to pay attention to the signals of when he had to go to the bathroom. This actually didn't go too bad. He would have accidents, but it appeared he started to learn when it was going to happen and would try to make to the bathroom. Once we had all of that in place, we started the actual plan. 1. We woke up on a Monday morning and put him in underwear. I said to him over and over again, "If you have to go potty, what do you say?" TIH would say, without fail, "Mommy? I have to go potty." He repeated it like a script. 3. Every time he successfully went pee in the toilet, he got 1 sticker on his chart. He also got 3 edibles. The reason for the edible is the instant gratification factor. The sticker is a delayed reinforcement system. So he needed something immediate to reinforce the behavior, but also needed something to work towards. 4. Every time he successfully went poop in the toilet (eventually...this part was an uphill battle), he got 2 stickers on his chart. I went back and forth on how I felt about this. It seemed to me that giving the poop more weight, may actually increase his anxiety about doing it on the potty. I'm still not totally sure it didn't do exactly that. But, it was a plan and instead we decided to remain consistent. He still got the 3 edibles as well. 5. 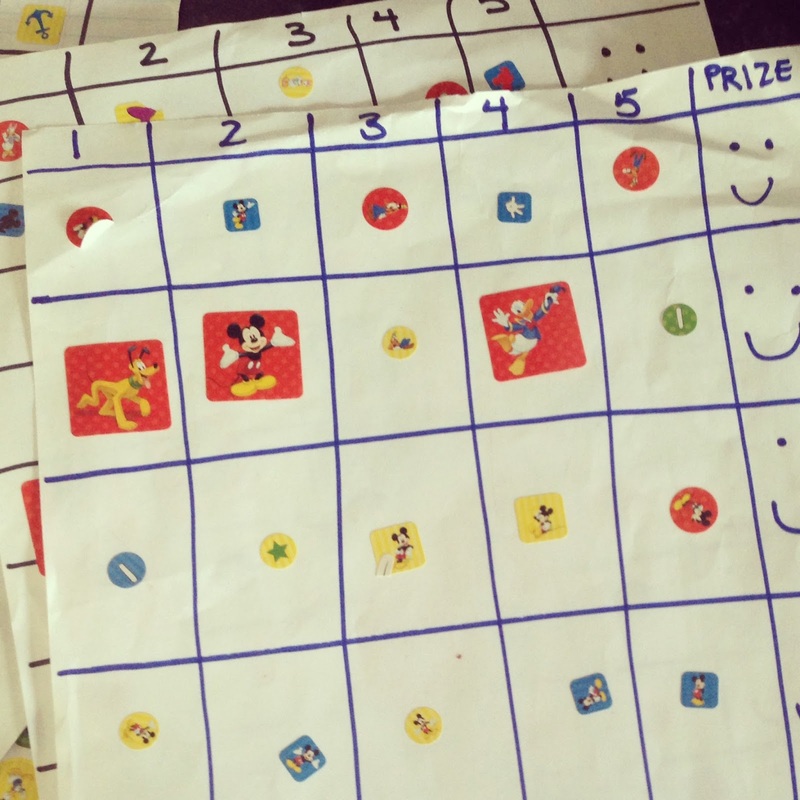 When he earned 5 stickers on his chart, he would get to pick a prize from the tub of toys. I labeled the plastic toy tub with a smiley face and put a smiley face at the end of the five stickers as a reminder of what he was working for. All I had to do was count the stickers he had earned and then point to the smiley face and he would say "I get ANOTHER TOY!" This part went REALLY well. I knew it was working when he would try to earn toys faster by sitting on the potty for a second, doing nothing, and saying "I get a sticker!" He didn't get a sticker (only if he actually went), but I knew that by "faking" it he was enjoying working for the toys, stickers, and edibles. 6. If he did both at the same time, we gave him 3 stickers. But always just 3 edibles. Those were our rules. You can make your own. As long as you stick to the same plan every time. The great thing about this plan was that it could travel. I could bring a plastic baggy of M&Ms and his sticker chart with us. He could pick out a toy when he got home if he earned it while we were gone. Being mobile definitely helped to relieve the "trapped" feeling I had in the initial days of potty training. Also, there was always LOTS AND LOTS of verbal praise. Never enough verbal praise. We were hoarse from screaming "YAY PEE PEE ON THE POTTY!!!" by the end of the week. It's okay. Keep it up. They love that stuff almost as much as they love the stickers and chocolate. When it was time for him to return to school, we kept all of this up at home. Since we got a report of any accidents while at school, every time he came home without any accidents, he would automatically get a toy (we assumed he had at least 5 successful trips to the potty while at school.) As soon as he got home we just started up again with his sticker chart. Once he had earned several toys and gone through several sticker charts, we upped the ante a bit. He had to now earn 10 stickers for a prize. Eventually (within a couple of months) we were able to fade all of this (except for the verbal praise, that will never end) and still have success on the potty. Where we stand now is that he hasn't had a single accident in about a week. In recent times, when we have had accidents, it has been because he is distracted or too busy. We are usually able catch him in the act and still make him go to the toilet. Followed by lots of positive praise for trying. I can't give TIH's preschool enough props. Very quickly, his teachers were able to pick up on his cues and knew they sometimes had to push him to try the potty even when he adamantly refused. Plus lots of praise. Because they're awesome like that. So, that's that. Please feel free to email me your questions. I can help you troubleshoot. Or, I can tell you which box of wine yields the most glasses and which carpet cleaner gets stains and smells out the best. It's all relevant.